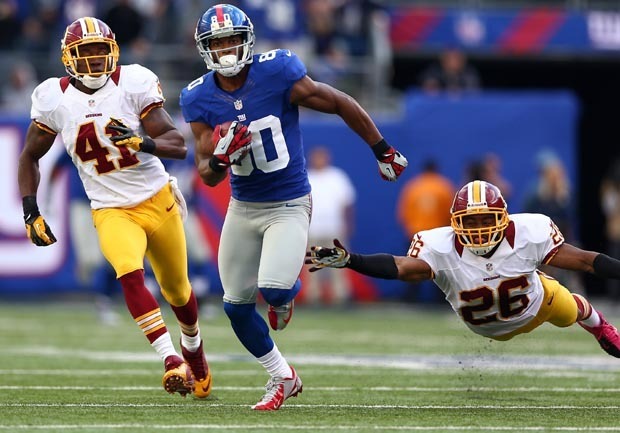 Victor Cruz visits home of 6-year-old Giants fan killed in Conn.
NEWTOWN, Conn. New York Giants receiver Victor Cruz has visited the home of the 6-year-old Connecticut shooting victim who was buried in a replica Cruz jersey. After learning he was Jack's favorite player, Cruz wrote "R.I.P. Jack Pinto," "Jack Pinto, my hero" and "This one is 4 U" on his shoes and gloves for the game against the Falcons this past Sunday. Cruz said that he called the boy's family after hearing he was a Giants fan and was told that they planned to bury him in one of Cruz's No. 80 jerseys. Cruz told WFAN's Mike Francesa on Monday that he hoped visiting Pinto's family would help them heal. "Sometime this week I definitely plan on going up there," Cruz said in his weekly spot. ""Just visiting with the family for a little awhile and talking to them. Just spending some time, try to put a smile on their faces in a tough time." "Being close to home, the players were greatly upset about it," Coughlin said. "Many of the players have young children so they can empathize with the parents who had young children killed."